Maybe you can't get there to wrap someone special in a hug and tell them happy birthday, but that doesn't mean you can't show up in a memorable way. 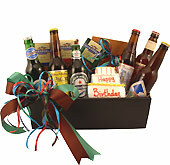 Ship a birthday box loaded with craft microbrew and gourmet treats, and your loved one will know that you're celebrating their life along with them. Sometimes the best gifts are unexpected. I Purchased this Birthday Box for my 36 year old son. He received it, and was thrilled that I thought enough to get him something so unique that was specific to what he enjoys to do....try different microbrew beer! It arrived on his exact birthday, which was purely happenstance. I will order from BeerGifts again, very pleased. He also expressed his joy in getting chocolate...which his wife and kids like. Always love ordering your products for a hard to buy for family member. He never gets tired of receiving his Beer gift package. Items are well packaged and arrive when they say they will. Excellent product and customer service. Will certainly continue to purchase products from you. my husband got this as a birthday present and said it was well boxed and put together very nicely. It was a success and I would order from you again! Thank you for helping me make my brothers bday great, even from over 2000 miles away. It arrived quickly & everything was beautiful. My Dad loved his gift. 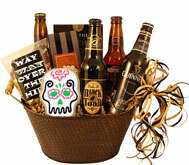 A beer lover and a man who you can never figure out what to get him...It was perfect! A big hit! My bestie loved her gift. Service was fast and quality was amazing. I'll definately be a repeat shopper. My son in law absolutely loved this gift and enjoyed the beer. What a great idea!!! Thank you. The gift package created a huge surprise for my son!!! It was the best decision I made.